As we get older, our strength, endurance and flexibility changes over the course of the years and typically decreases. This can be extremely dangerous as decreased health and fitness will increase the risk of various health complications such as heart attacks, diabetes, obesity, back pain, etc. People in poor condition are also less agile which can cause injuries and/or fractures. Research has proven that our health degenerates with age, but this decline can be the result of a lack of exercise. Sufficient exercise can keep your health and condition in top shape. In some cases, elderly individuals can be in better shape than those much younger than them simply because they exercise. 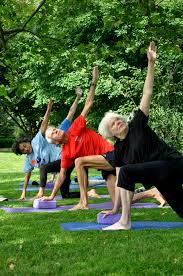 The most important advantage of exercise for seniors is that it will prevent diseases and health complications. It will prolong their life expectancy and keep their mind and body young. Exercise will keep seniors strong, making them able to complete more tasks without depending on others. This will give seniors independence without the need to rely on others to help them. As seniors age, their social network can decrease due to many different reasons. Being active is a great way for the elderly to stay energized and even make new friends. Depending on your age, vitality and physical abilities there are a wide range of sports seniors can participate in. It is always a good thing to not rush into anything and to always consult with a doctor before getting started. In many cities, there are sporting associations that offer special senior classes or senior groups who regularly who exercise together. You could initiate your own group by gathering friends, neighbors and/or people from a senior home. Exercising with another person or with a group will help you encourage one another while being socially active at the same time. Choosing a suitable sport will depend on your physical condition, your goal and your interest. If you are someone who has high blood pressure, it might be a good idea to do cardiovascular exercises. You could start taking (brisk) walks or even go for a swim. Seniors who want to increase their strength can join a gym and have a program made to suit their goals. The advantage a gym is that there is always professional supervision. If you enjoy music, you can join a dance class or gather some other people and hire a teacher and organize a class. Remember, if you have lived a sedentary lifestyle, all extra activity is a plus. Even carrying heavy loads of groceries or pushing a land mower is physical activity. It doesn't really matter what you do, as long as you keep active and enjoy the activity! Always stay safe: It is very important that you start off to slowly to adapt to your new routine and prevent injuries. It is recommended to consult with a doctor or physical therapist before you begin. Find a gym that has offers sports, classes and training for seniors. Check that personal trainers have experience training the elderly. Motivation: Set short term goals to keep motivated. For example: if you want to start taking the stairs instead of the elevator, start out with taking the stairs once a day the first week and then increase by 2/3 times the following week. Fulfilling goals is gratifying and will inspire you to set higher goals. Find a companion: Working out with a friend or in a group has the added benefit of being socially active and motivates you to keep on going.